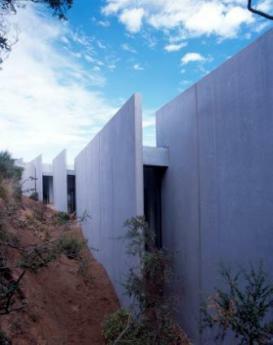 The Concrete House is a private residence located within a National Park on the Mornington Peninsula in Victoria Australia. Predominantly constructed on a single level, the house has been designed with specific reference to the coastal environment. Contemporary factory finished materials, including raw precast concrete, anodized aluminum, galvanized steel and glass form the external envelope. These elements form a 60 metre long platform abutting the east boundary. The entire west elevation is glazed to siphon the dominant view into the interior. The view is framed top and bottom by the floor and roof plates. The projected lower eaves of the sloping roof plate control westerly sun. Northern light is available through a series of glazed apertures between the staggered precast concrete walls. Upon arrival, the visitor is confronted by the expanse of monolithic precast concrete walls. These strategically located walls screen the coastal view from the street. A series of theatrical plays occur when descending the entry chamber on the concrete catwalk. The walls create a ‘slice’ of the coastal expanse – a ‘frozen moment’ enhanced by the glazed front door entry chamber. Interior finishes have been selected to compliment the external rugged environment. Tongue and groove bamboo solid flooring has been used. Solid bamboo sheets have been used for joinery surfaces. The carpet was designed to mimic the tea tree scrub canopy at window sill level. The architects designed all internal furniture including beds, couches and tables. This project has won numerous awards including the Kevin Cavanugh Gold Medal for Design Excellence.